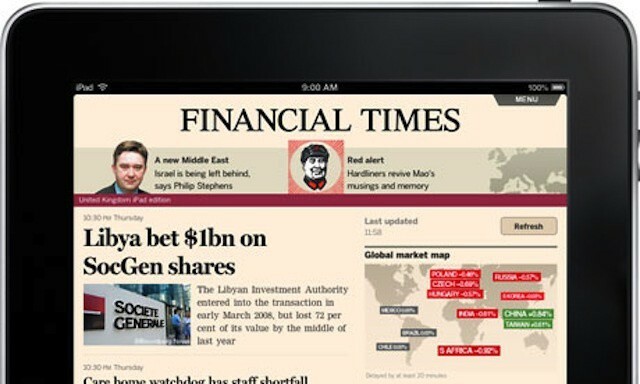 Is the Financial Times leading a mass exodus from Apple's Newsstand? When Apple announced the terms for Newsstand and digital subscriptions, many publications felt that the company was being too hard on them. Apple’s requirement that publishers offer the same deals through the App Store that they do elsewhere while still taking its typical 30% cut of the income ruffled a lot of feathers in the publishing world. While there was a lot of angry discussion about the policy when Apple announced and implemented it, many publications decided to accept the policy – at least initially. Since then, however, a handful of publications have decided to abandon their presence on iOS devices. Some are planning to build a web app as their only iOS or mobile presence. Others are looking to create deals with various news aggregators. Regardless of their plans, Apple’s terms are one of the key reasons that publishers are getting out of the App Store. Mobile industry research firm VisionMobile looked at some of the reasons that publishers, including the Financial Times felt that abandoning a native app strategy was in their best interests. They identified three core reasons that publishers want move to a web-based model. The decision to create an iOS app requires an investment by publishers. Developing a solid iPad version of a newspaper or magazine isn’t as simple as creating a PDF of the print content or putting a nice iOS wrapper around an existing website. There’s nothing compelling in that approach that would make most people want to subscribe and pay for the experience. Publishers need to rethink the form that their content takes to deliver a successful iPad edition. That costs money. Updating the app after launching costs money. One argument from publishers is that they can’t afford top-notch developers. Using a mobile website involves less expensive skills and less time. It also delivers content to multiple devices and platforms. Apple’s 30% stake is big issue, but it’s only part of the problem that developers jumping ship identify in their relationship with Apple. In addition to losing money, publishers feel that they’re also losing some control of their product and businesses processes to Apple. One big example is that publishers don’t control Apple’s billing arrangements. That means that they don’t have all the information about readers that they would in a traditional subscription model. Apple did offer concessions about user data but insisted on letting customers opt out of it. The final reason is that people don’t read long form publications as they did in the past. Gathering news and information online has led to people not prioritizing reading an entire magazine or paper cover-to-cover. This argument runs counter to the idea that ebooks are actually encouraging long form reading. Ultimately, however, this belief along with the success of certain news aggregating apps like Flipboard, Zite, and Zinio is leading publishers to allow their content to be broken down and repackaged. Does this mean that Apple has overplayed its hand? Possibly, but it seems too early to tell if these are relatively isolated incidents or the beginning of a wave of defections from Apple’s Newsstand.